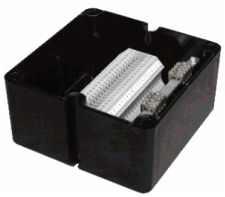 The GRN enclosure has been designed as a cost-effective junction box for use in hazardous areas. There are a number of terminal and entry configurations available, resulting in a highly versatile enclosure which is suitable for a wide variety of installations. The enclosure is manufactured in a UL approved UV stabilised polycarbonate and is available as a pre-assembled terminal box or as an empty enclosure for OEM applications. It can be supplied with the option of a terminal rail, an internal chassis plate or directly mounted terminals for cables up to 4 sq mm. The GRN8 is a competitive product for lower risk applications in both safe and hazardous areas. It is designed to operate within the ambient temperature range of - 20°C to + 40°C but for non hazardous application the upper ambient temperature range can be extended to + 90°C. As well as being UV stable, polycarbonate is resistant to a wide variety of chemicals. The use of silicone rubber lid gasket and 316 stainless steel lid fixings ensures that the chemical resistance of the GRN is not compromised. Earthing can be accomplished by various means. The provision of an internal/external earth/ground stud is optional or one of the terminals can be dedicated to earthing / grounding functions. Additionally, there is the facility to mount an earth bar inside the box which can be used to terminate and connect as many earthing wires as there are cable entries. This method is useful for the equi-potential bonding of metal cable glands and an additional equi-potential wire can be linked to the internal/external earth stud to facilitate a positive connection to the ‘plant dirty’ earthing system. The earth bar can alternatively be used as a clean earth for instrumentation as it can be electrically isolated from the dirty earth. The GRN is ATEX certified for use in Zone 1 hazardous areas Ex ‘e’ to BS EN 50019:2000 for Zone 1 and Zone 2 applications, BS EN 50281-1 for Zone 21 and Zone 22 applications and Ex‘nA’ to BS EN 50021 for Zone 2 applications.